Halloween was a lot of fun this year! As you can see, Richie was a monkey. 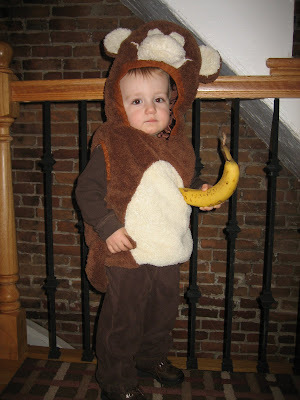 He carried a banana, made monkey noises, and had a tail like Regina. We went trick or treating through the neighborhood carrying Elmo and getting candy. We had to have something Elmo because at some point this past month Richie decided he actually wanted to be Elmo and not a monkey. Luckily that crisis was averted and he loved being a monkey. He was actually sad when I told him Halloween was over and we were putting the monkey away. And the Revette's came with us. 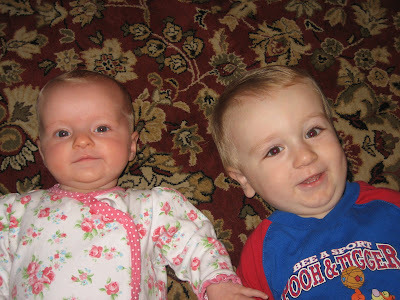 We had the 2 cutest "Chunky Monkeys" in the whole North End. Since we got such a nice sized pumpkin we decided to carve it into a jack-o-lantern. So we rolled up our sleeves and got on the floor to get messy. 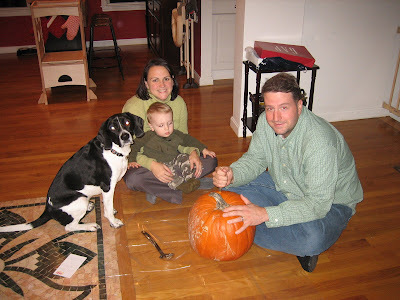 Last year Rich screamed when Chris pulled the top off of the pumpkin. This year he was just a bit skeptical. And although he got out some of his tools, he was not interested in helping. And really Chris did all the work. I think he did a good job! 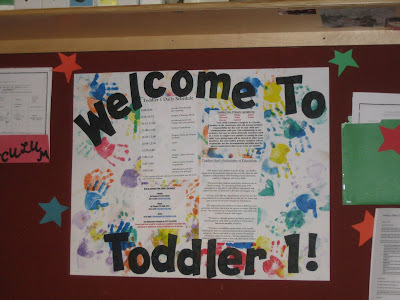 Yes, today was our first day of Day Care. It went really well although we only stayed for 2 hours and I didn't leave. OK, so maybe it doesn't count yet. Wait until next Tuesday and I am sure I will have more to report. Richie and his main teacher Diana. His other teacher Taneka and the boat. The best toy in the place! All his new friends. They are all boys and one girl. I think it will be good because poor Richie already has enough woman in his life! This weekend we went to NY to visit with some family and friends. 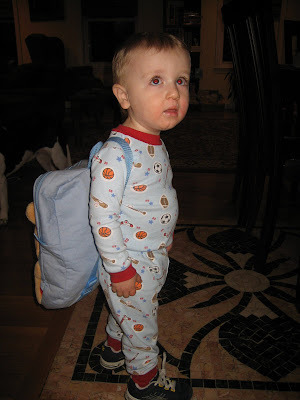 Here is Richie with his toys packed up and ready to hit the car. We got to spend tons of time with Grandpa and Nana Sheila. We ran around their big yard playing ball and Nana made us lots of good food. Then we went to the Blanco's house. They put us up AND babysat Richie while we went to Pat and Laurie Cummings wedding. That was a deal we will take again! 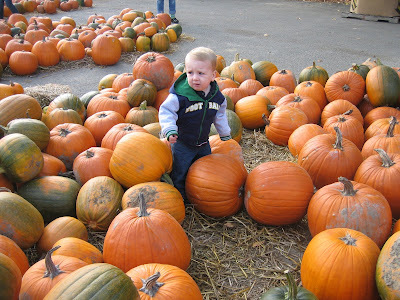 Just had to post our token pumpkin picking pictures. We got 2 pumpkins. The big one seems to be Daddy's. Not sure why it isn't also Mommy's, but he insists it isn't. Next time I have to remember to get my own. And this one is his. We had to take it because he tried to dribble it like a basketball and rolled it across the parking lot before we even left. It is already bruised and will probably be rotten and have to be thrown out before we even make it to Halloween. It was a busy Friday. It started off with a trip to the doctor for a flu shot. I have to say, Richie did awesome! He cried when he was actually getting the shot, but then loved his basketball band aid and his sticker that the nurse gave him. He thought he was touch stuff because he held his head high, strutting his way out of the office waving to everyone he passed. 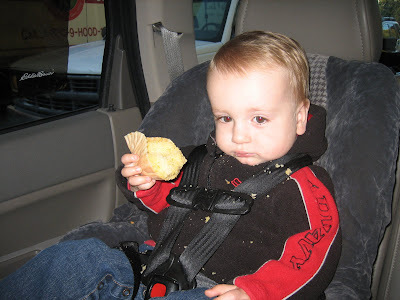 This picture is of the muffin he got as a treat for being such a big boy. He wanted a donut (who puts donuts for the letter D in a kids book anyway?? ), but I luckily changed his mind. This picture doesn't do the mess he made any justice either. Thank goodness we have a dog! Then we went to Castle Island in Southie to watch the airplanes and boats. And the best part, was Lisa came over that night to babysit. Yep, Chris and I had a whole dinner, just 2 adults. It was great! And of course, we were still home by 9:30. Can't stay out much later than that these days. This weekend I was lucky enough to have my friend Colleen come for a visit from Portland, OR. I haven't seen her in a long time so it was nice to get to spend some time catching up. She wasn't able to bring her son Henry, but she did bring her daughter Francie for us to meet. We had our friends over so Colleen could see everyone. AND while Colleen was working, we were able to babysit Francie. 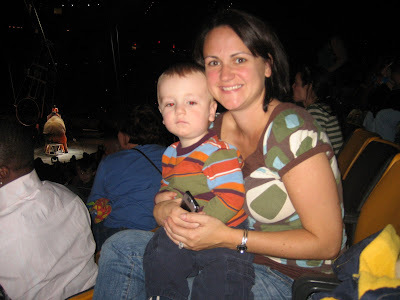 After seeing the elephants walk down Hanover Street, we were lucky enough to go to the circus with Colton and Kelley. They had all of the great big animals and acrobatics. Richie did miss the lions because he took a "nap" during part of the first half, but he woke up in time for the elephants. And this was actually an all boys event. 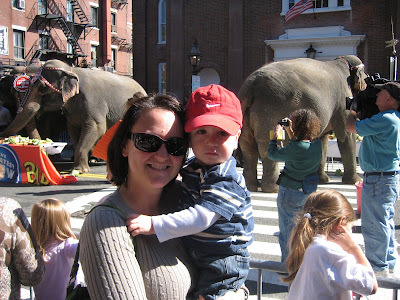 We had the luck of getting to see the elephants of the circus early! They paraded them through our neighborhood so we went down to see the big ladies. We saw them eat all kids of veggies and bread. Richie hasn't stopped talking about them since. 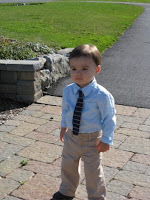 Richie went to his first wedding this weekend. Scott and Michelle got married and they invited all the kids. I just had to post a few pics because it was all too funny. From what they wore to what they did......I can't stop laughing. First of all, I think the 2 boys pulled off the dress code of "classy casual" the best. Richie was an animal on the dance floor. As you can see: he danced with a girl......danced with the other kids.....danced by himself...........and yes, even did the worm!! Since it was Babci's birthday we went to visit for the weekend. 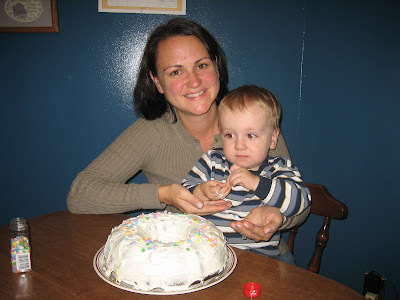 We made her a cake and spent lots of time with her.